While playing Pokies online you come across some terms or words or symbols associated with Pokies games. Let us know about the five basic terms that we find often while playing pokies online. 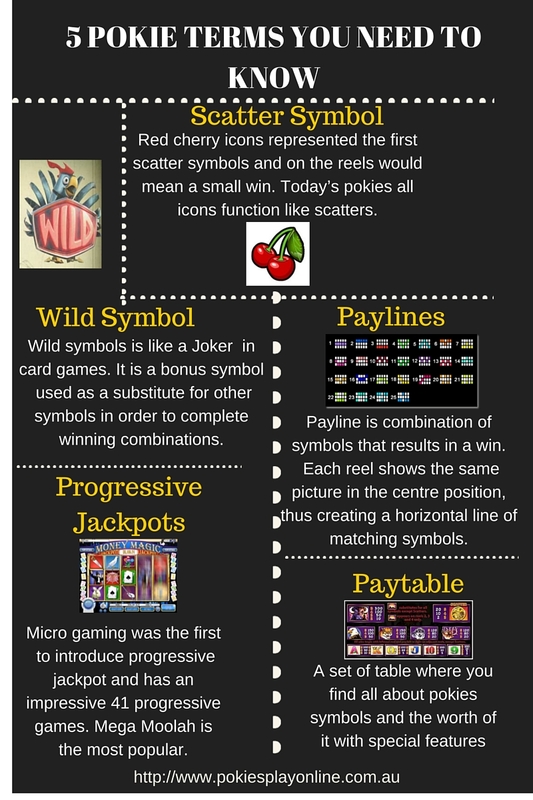 You find symbols in pokies game and you should know that how each symbol helps you to win. One of the most important symbols found on modern day pokies is the scatter symbol. The scatter symbol provides opportunities for additional wins and serves to unlock bonus features and games in many pokies machines. Scatter symbols were introduced in pokies to add excitement in games. You need to have a minimum of three scatter symbols to show up for the free spins bonus and the more Scatter Symbols that do show up from just one spin, the more Free Spins you normally have. Scatter Symbols will also award some kind of guaranteed coin prize when two or more appear anywhere on screen. The ‘Wild’ symbol has the ability to substitute all other symbols on the reels to help generate winning combinations. The only symbols that the Wild Symbol usually will not substitute are the Bonus Symbols and the Scatter Symbols. ‘Bonus’ symbols are usually the symbols that trigger some kind of fun side game. These ones may have to appear in a certain order across the reels before a bonus round will trigger. The scatter icon, as the name suggests, can be scattered anywhere on the reels and does not have to fall on an active payline to produce a win for the player. Bonus icons trigger bonus features, and are not commonly found on classic slots, but are often used in video slots. The ‘Payline’ is a line which stretches across the reels in a particular way and three or more matching symbols usually have to land in consecutive order across one of these paylines for you to be awarded some kind of line win. Some pokies have anywhere from 1 to 100 winning paylines and you can view how they stretch across the reels by heading towards the back of the paytable. By Pay Table you will come to know of everything you need to know about the pokies you are playing. You can view the paytable to find out which symbol is Wild, which ones are the Scatter Symbols and also which ones are the Bonus Symbols. You can also find out how much each symbol is worth in the paytable and the bonus rounds alongwith the special features. Micro gaming was the first online gaming software provider to introduce progressive jackpot. The Mega Moolah progressive jackpots are very popular. The ‘Progressive Jackpot’ is an accumulating jackpot which can keep on adding to no fixed amount until one lucky player wins the entire pool. Once a progressive jackpot has been won the jackpot size will go down to the starting point and the whole process will begin again. Many players only play progressive jackpot machines once the jackpot has reached a lucrative size, believing that once a certain size is reached, the game is more likely to pay out quickly. Is Christmas Island the Future of Aussie Medical Pot? What are the seven games that pay well and can improve my winnings?